Review: It's the future. North America is now Panem, which is comprised of a capital city and 12 outlying districts. The wealthy Capital controls the districts through isolation, propaganda and poverty. 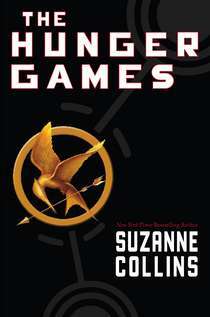 Each year, the districts "nominate" a male and female between the ages of 12 and 18 to participate in the 'The Hunger Games.' While the contestants are treated like stars (they each have stylists and coaches) they are fighting for their lives. For the 'Hunger Games' are a televised fight to the death. The "winner" becomes a celebrity of sorts throughout Panem and their district receives extra food and money for a year. When 16-year old Katniss Everdeen hears her little sister's name called to be a contestant in the Games, she steps up and takes her place. Peeta, a classmate who once saved her life by giving her food when her family was starving, is also called into the games. What follows is a captivating book that made me laugh, cry and hunger for the next two books. *Note: this is not a "happy" uplifting type of book and therefore is not for everyone. This is marketed as a young adult book in the US so although there is violence, it is not overly graphic. There is no bad language.